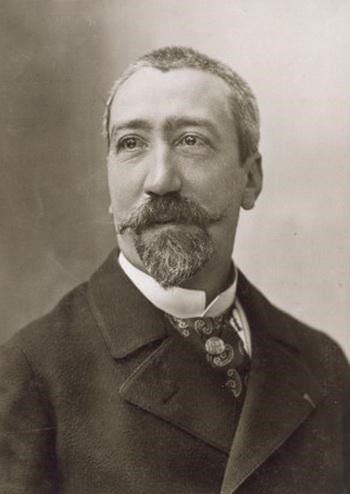 He started his literary career in 1867, writing articles and poetry with the pseudonym Anatole France. He became famous with his novel The Crime of Sylvestre Bonnard (1881), which earned him a prize from the French Academy. Other novels cemented his fame, and he was elected as one of the “forty immortals” of the French Academy in 1896, at the age of fifty-two. In 1896 the country was rocked by the Dreyfus affair; Alfred Dreyfus was a Jewish army officer who had been falsely convicted of espionage in a case that had anti-Semitic overtones. France fought along another fellow novelist, Émile Zola—the author of a famous piece, “J’accuse” (I Accuse)–in defense of Dreyfus. He wrote about the affair in his 1901 novel Monsieur Bergeret. The scandal ended with Dreyfus being proven innocent.